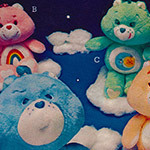 Highlights from the 1986 Sears Wish Book! | Dinosaur Dracula! 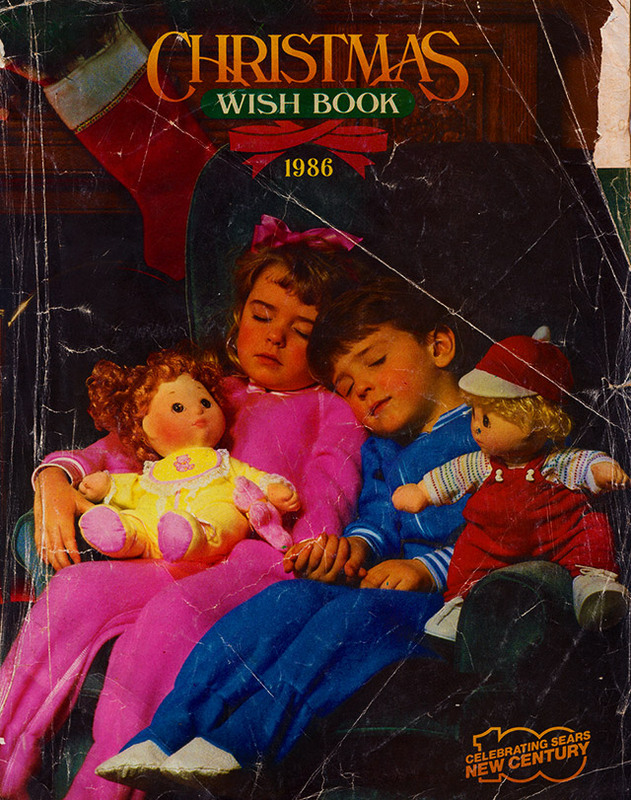 Behold, the 1986 Sears Wish Book! This was a big one, guys. Action figures as a concept were at peak heat, and toy companies were literally going for broke. It’s not simply that there were so many action figure lines competing, but also that they were all so different. 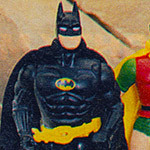 It’s easy to see why many people my age cling fiercely to this hobby: We grew up when action figures were the best game in town, and even if they rarely are nowadays, we’ll always know what they can be. Below are nine highlights from the ‘86 Wish Book, covering everything from Transformers to space cadet Cabbage Patch Kids. Even with all of this, I could easily do another 5 articles from just this one catalog. Now among the most famous Masters of the Universe collectibles, Eternia was as much a white whale in the mid ‘80s as it is in 2016. 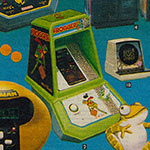 Added to the toy line well after its popularly peaked, Eternia also suffered from a retail price that still sounds extravagant. Essentially a cross between a model train set and Disney’s monorail, Eternia was doubtlessly ambitious, but perhaps too much so. With the older Castle Grayskull playset, you could throw that thing off the roof and it’d still work the same. Eternia was more of a house of cards, even if some of those cards were demonic spires, and the joker was Blue Simba. Sneeze at this playset, and you’d be left with 400 mini playsets. Course, what may have been flaws in 1986 are big huge plusses in 2016. As a display piece, Eternia is one of the best toys of the ‘80s, and also the one that doubles best if I want my action figures to solve crimes at the spooky theme park. Boxed specimens now sell for over two thousand bucks, so if you know anyone who has one, beg for money. I was all about these post-movie Transformers figures, and actually count three of the ones shown here among my favorite-ever stupid toys. I was also a big fan of the Rodimus Prime figure, mainly because his vehicle mode looked like the Corvette version of a Winnebago. Whether as a kid or a collector, I’ve owned everything on this page at least once. That included Predaking, who was even more awesome in person than he looked in the catalogs. Picture Devastator, but three times heavier and dressed like a turkey from a school play. There’s something off about this one. 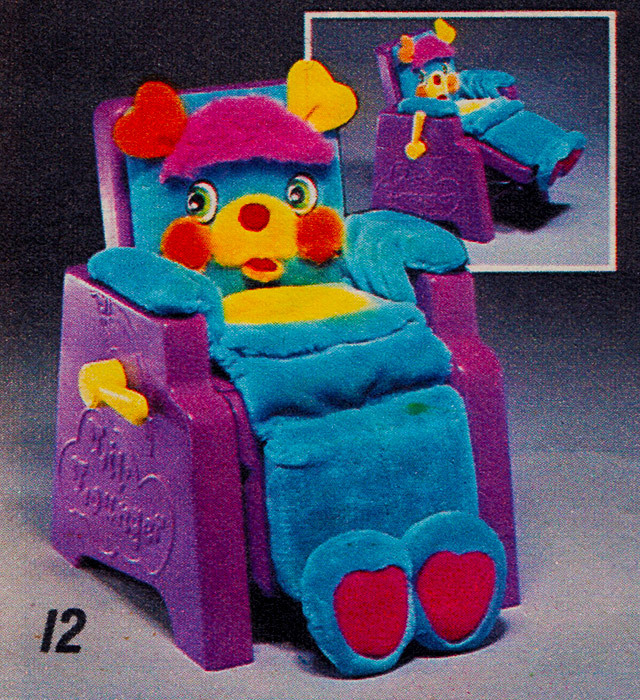 I thought it was the mere fact that there was a living, breathing Popple chair in the Popples universe, which tellingly made me remember that one Dinosaurs Attack card where the guy begs the other guy to shoot him because a dinosaur blipped into present day right on top of him. What happened to you, Chair Popple? Upon further inspection, I see that it’s really because this looks like Popple taxidermy slumped over a chair. Like one of those scary animal rugs that make me cancel reservations at iffy motels. 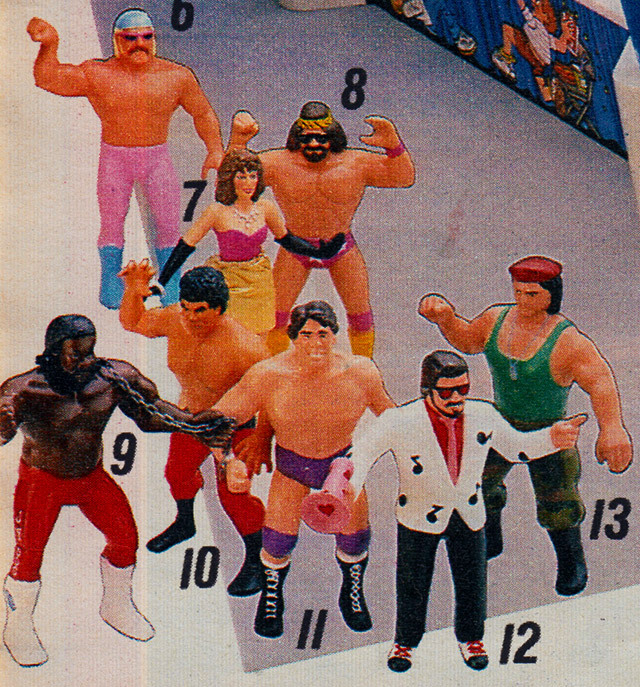 I had a zillion Wrestling Superstars figures as a kid, including half of the ones shown here. 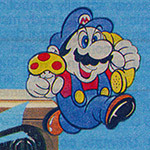 As I recall, Jimmy Hart’s megaphone worked like a suction cup, but more specifically a suction cup that passed no tests. Most of you don’t follow wrestling, so I won’t bore you with biographies. I will only mention that the human flamingo on the upper left is actually Jesse Ventura, who’d go on to become the governor of Minnesota, and more importantly Captain Freedom from The Running Man. 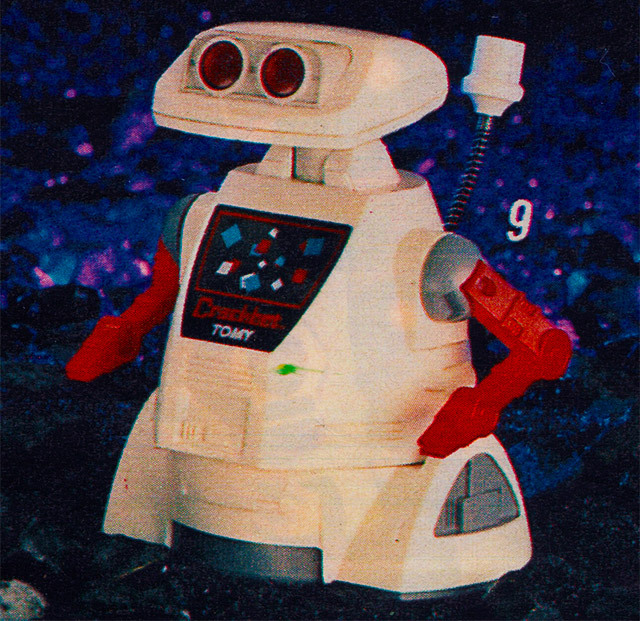 There were tons of robot toys in the ‘80s, ranging from tiny novelty varieties to mechanical beasts that could literally serve you dinner. Somewhere in the middle were these two. 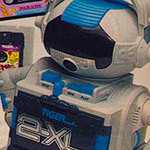 They’re part of a bigger line of palm-sized robots that each had a specialty. 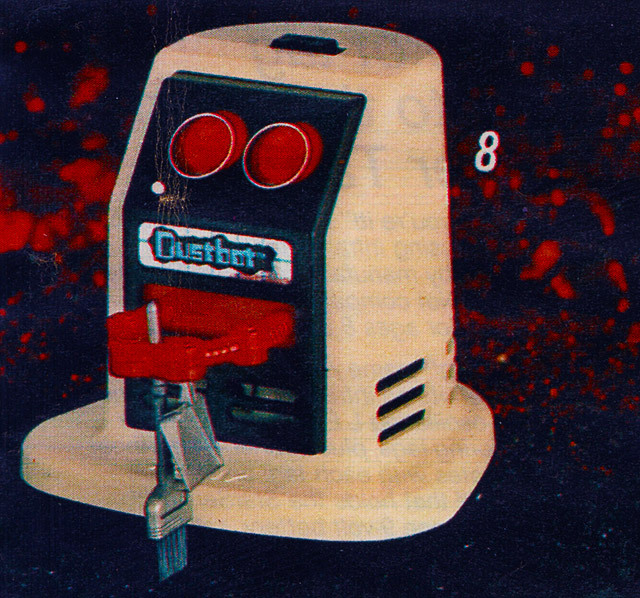 In this case we’re getting Crackpot, so named for his “comical, herky jerky arm movements,” and Dustbot, so named because he was a semi-intelligent roving vacuum cleaner. The robots are so adorable that I’m surprised that nobody never flirted with the idea of an animated series. I don’t know, maybe they did. Maybe NBC just didn’t want to bump The Smurfs. If I ever get around to turning Eternia into a theme park, I can use Mumm-Ra’s Tomb Fortress as its dark ride. 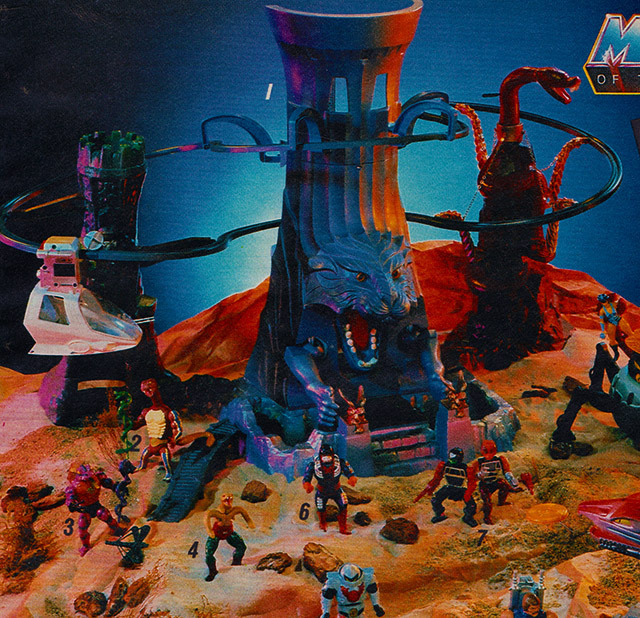 The playset let you “magically transform” the decrepit extra-mummy version of Mumm-Ra, which was included, into the ripped blue one, which wasn’t. 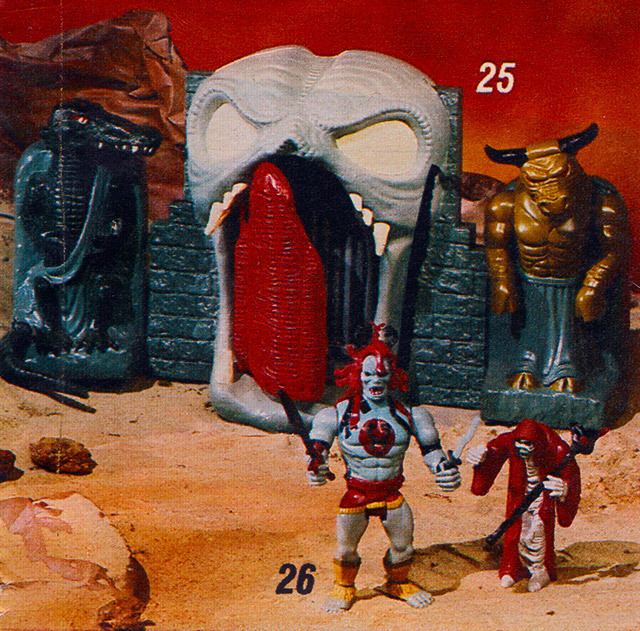 So I guess if you had this playset but didn’t have a blue Mumm-Ra, you had to turn grandpa mummy into Tygra. Since such transformations happened in almost every episode of the animated series, Thundercats fans were all over this one. Some would later use the golden bull idol as a stand-in for Giant Fake Yogurt while playing Spaceballs. My Pet Monster and DaZoo! 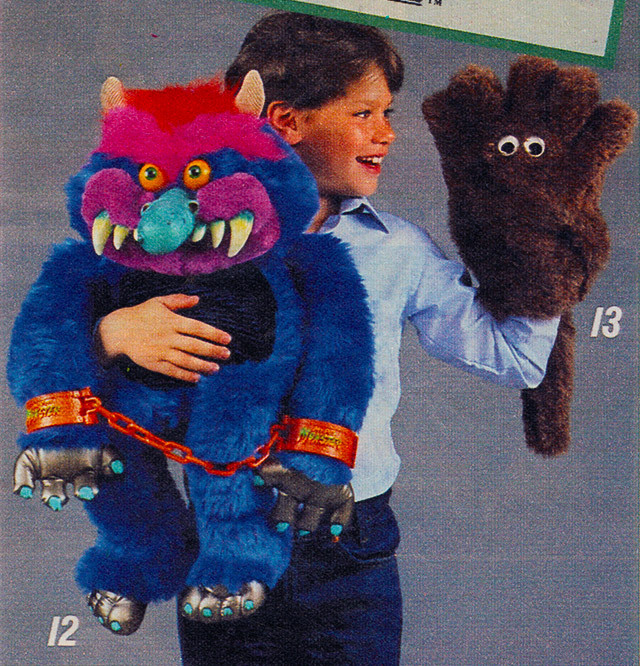 Jeez, that is a PERFECT PICTURE of My Pet Monster. It’s weird to see one that isn’t halfway ratty. Since I’ve already written about that doll’s magnificence, I’d instead like to focus on the… on the whatever that is on the kid’s left hand. What the hell? Sears identifies it as DaZoo, a “five-fingered paw pal that you wear like a glove.” I’d never even heard of DaZoo before spotting him here, but online evidence supports the idea that he did exist, and that he really was a puppet that looked like a hairpiece with googly eyes. These are kickass! 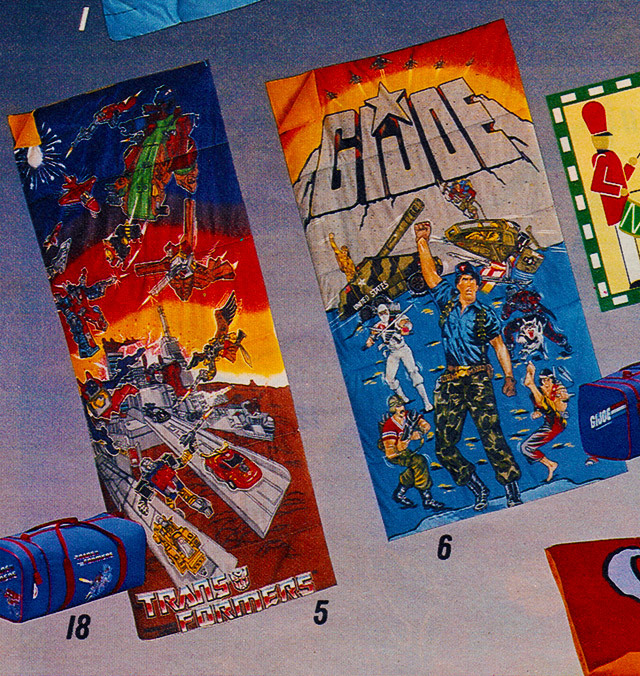 The art on the Transformers bag was commonly used, but the way they did it here made it seem like the Autobots were trapped in a parallel universe where everyone was a Colorform. I dig it! The G.I. Joe bag’s “interesting” use of color turned what was obviously meant to be land into an ocean threatened by a rogue wave… which in turn suggested that both Storm Shadow and Bazooka could walk on water. In reality, only Storm Shadow could do that. 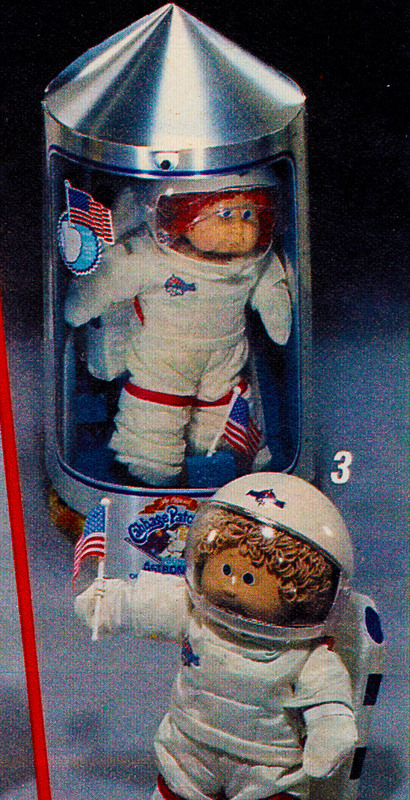 Cabbage Patch Kids Young Astronauts! I never asked for a Cabbage Patch Kid, but I came close twice. Once was over those Koosa dolls, which were animalized takes on the Cabbage Patch Kids. I couldn’t envision being enriched by a plastic-headed baby doll, but I could totally see the merit in one that was part lion. The other time was with these, the Young Astronauts. I thought the helmets looked cool and could maybe even be appropriated for less Cabbage Patchy dolls, but that shuttle-shaped case was an even bigger draw. 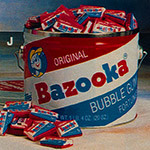 It was like the discount version of the G.I. Joe Defiant playset. Thanks for reading about another ancient catalog. This will probably be the last one before Christmas, but stay tuned: I have plenty of non-holiday catalogs to cover in the new year! More Highlights from the 1989 Sears Wish Book!